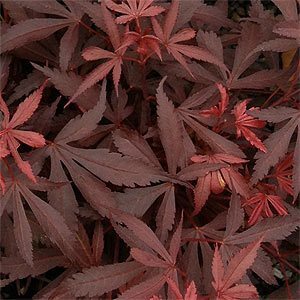 If you are looking for a compact Japanese Maple suitable for a small garden or for growing in containers then Acer palmatum shaina could be the one. Brilliant new red foliage that changes to a deeper red and then transforms itself to a bright red in the Autumn. This is a dense and compact cultivar, reaching around 3m in height with a nice globe shape. Excellent in the rock garden and grows well in a part shaded position. This is a witches’ broom mutation. Growth rate is fairly slow and may take 6 – 8 years to reach 2m. Leaves are not dissected and as with most Japanese Maples Acer palmatum shaina is relatively disease and problem free. A humus rich moist but well drained soil. Pruning is generally not required. Mulch well to retain moisture. In most areas it is best grown in full sun to part shade, in our hot summers we find that morning sun and dappled afternoon shade is best. This is a slow growing plant and an excellent choice for container growing. Like many of the smaller growing Japanese maples this is a tree suited to a number of garden design styles. Growing well in containers, this is a maple that look good beside a Japanese style water feature. The Chinese, Japanese or Zen gardens are an obvious fit. Shania also works well in smaller courtyard gardens as well as in larger gardens as a feature in the broader landscape. In a woodland or part shaded garden, the brilliant autumn colour that Shaina provides make a dramatic contribution to the landscape. Use as a feature plant in the garden, set into a lawn or in a container. Soil – Well drained humus rich.. Height – Generally around 2 metre with an upright habit. Spread – To 1.5 metres plus. Foliage – Deeply divided, red turning to crimson in autumn. Flowers – Small samaras, insignificant. Drought tolerant – No – subject to leaf scorch in dry soils in hot climates.